Miniature Santa Cruz Red-on-buff jar. Click the image to open the Santa Cruz Red-on-buff gallery. Santa Cruz Red-on-buff is type of Hohokam Buff Ware with a wide distribution extending from the middle Gila River valley, into the lower Salt River valley, north to the Tonto Basin, and southeast along the Santa Cruz River in Tucson. 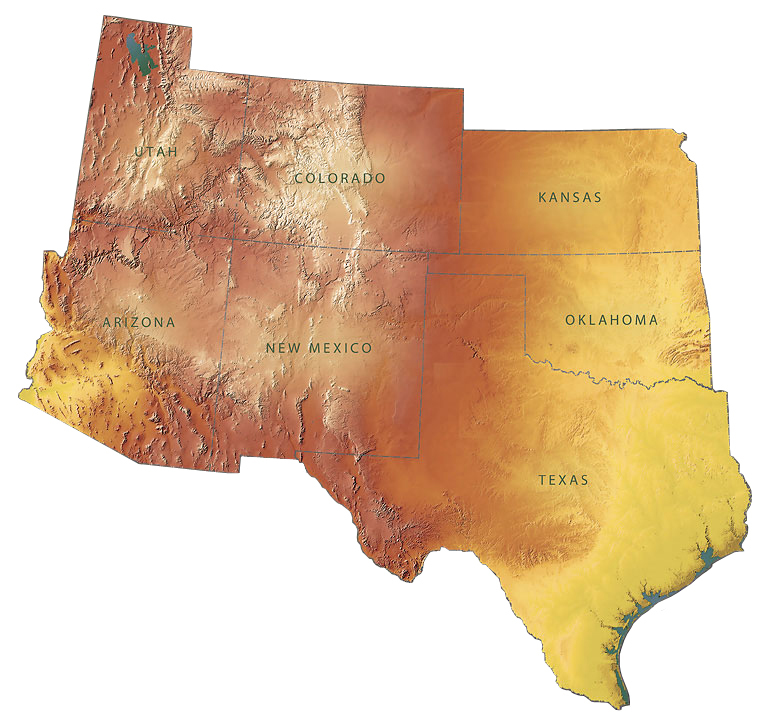 This type is also occasionally found south of the U.S.-Mexico border, west along the Colorado River, and east into New Mexico. The jar pictured above is also interactive! Date Range: ca. A.D. 850-950. Firing: In an oxidizing atmosphere; generally lacks fire clouds. Temper: Course-grained mica schist and quartz; calcium carbonate inclusions. Surface Finish: Muscovite mica is plainly visible on vessel surfaces; light buff slip, smoothed but not polished; sometimes porous. Paste Color: Surface color generally white, yellow-white, or tan; less often light brown, gray-brown, gray, or orange. 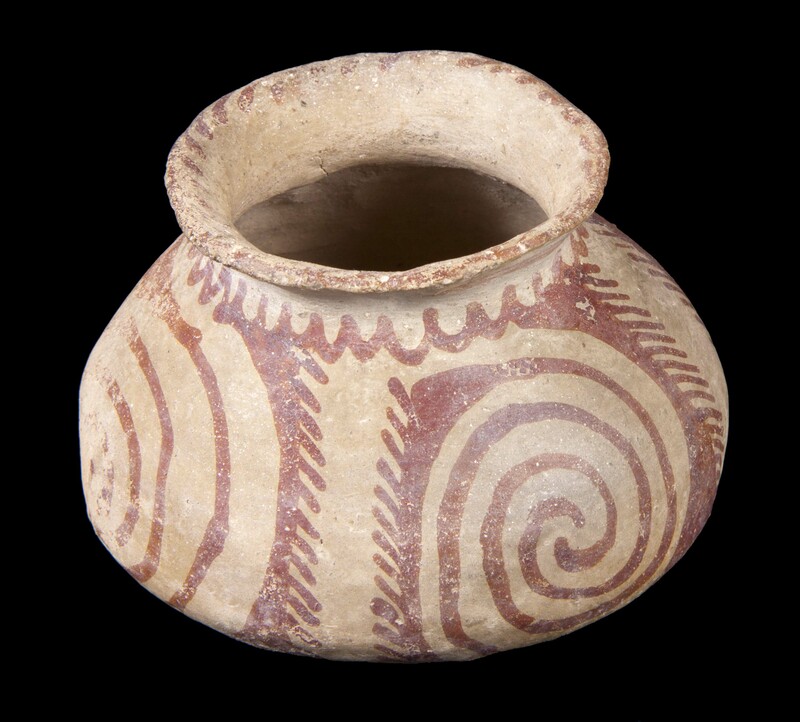 Forms: Bowls with flaring rim, jars, scoops, ladles, plates, censers, effigies; globular jars with short flared rims; flare-rim bowls with shallow, flat bottoms; and outcurved bowls with shallow, flat bottoms are diagnostic to Santa Cruz Red-on-buff and Late Gila Butte Red-on-buff. Design: Finely executed lines; small elements in banded/spiraling layouts; quartered layouts with fine wavy and straight lines; a variety of life forms; cuneiform hatching; slanted railroad tie hachure; wavy edge solids; fringe; flying birds; bowl exteriors generally have four to eight trailing lines. Key Traits: Thin vessel walls; thickest line less than 2.2 mm and linebird or organizational banding; cuneiform hatching. Comparisons: Gila Butte Red-on-buff has hatching as filler and is often incised; these characteristics are generally absent on Santa Cruz Red-on-buff vessels. Santa Cruz Red-on-buff has finer line work than Sacaton Red-on-buff; vessel wall thickness is also thinnest in Santa Cruz Red-on-buff. Sacaton designs are more widely spaced and bolder, with more solids and thicker lines. Abbott, David R. (2008) The Process, Location, and History of Hohokam Buff Ware Production: Some Experimental and Analytical Results. Journal of Archaeological Science 35(2):388-397. Abbott, David R. (2009) Extensive and Long-Term Specialization: Hohokam Ceramic Production in the Phoenix Basin, Arizona.American Antiquity 74(3):531-557. Wallace, Henry D. (1992). Cross-dating the Gila Butte Phase and a Reconsideration of the Ceramic Type Gila Butte Red-on-buff. In The Rye Creek Project: Archaeology in the Upper Tucson Basin – Volume 3: Synthesis and Conclusions, edited by M.D. Elson and D.B. Craig, pp. 29-54. Anthropological Papers No. 11. Center for Desert Archaeology, Tucson.